Sometimes, we'll publish a test, and get asked questions. While the WX 9100 is in no way a consumer-level card, we got asked how "Fortnite" runs on it. So, why not? To test out the WX 9100, we paired the card with -- and pitted its performance against -- Apple's latest MacBook Pro with Intel i9 processor and discrete Radeon Pro 560X GPU. With graphics settings pegged at a native resolution of 2,880-by-1,800 pixels, and all options set to high, performance on the laptop alone not too bad at around 25 to 30 frames per second. Gameplay was smooth and definitely playable. That said, many gamers would much rather forego high resolutions for high frame rates, especially in a fast-paced competitive title like Fortnite. We brought down the maximum resolution to around 1080p, or more specifically 1,920-by-1,200 pixels since the MacBook Pro has a 16:10 aspect ratio. Graphics settings were also set to medium to achieve a cap of 60fps. Removing the cap with the same setting delivered between 65fps to 70fps. Next, we hooked up AMD's $1,500 graphics card. Inserting the card into the Sonnet eGPU enclosure is a breeze, as is connecting the box to our MacBook Pro via Thunderbolt 3. For our tests, we output visuals to a standard 4K Samsung monitor. Closing the MacBook Pro and connecting our Logitech Craft keyboard and Logitech MX Master mouse, we were ready to get in game. Matching the resolution evaluated earlier, with identical graphics settings, the game ran at surprisingly low frame rates. Our first match saw rates hover at around 25fps to 30fps. Switching to 4K resolutions and "Epic" settings, the difference was immediately apparent. Graphics looked amazing, but gameplay was horrible at only 20fps. The performance was much worse than the Blackmagic eGPU Apple released last month. Connected to a 13-inch MacBook Pro, that box was getting around 35fps at 4K with Epic graphics settings. As expected, and as demonstrated, workstation cards are not designed for gaming, even a $1,500 model with massive under the hood power. The WX 9100 excels when it comes to professional apps, as you saw in our last performance test, but for gaming it turns in a poor showing. AMD's Radeon Pro WX 9100 Graphics Card is currently available from third-party sellers on Amazon for $1,449.99, a discount of $50 off MSRP. B&H also has the video card in stock for $1,499.99 with free expedited shipping and no tax collected outside New York and New Jersey*. Those looking for the WX 9100 and Sonnet Breakaway Box 650 can currently save $200 on the kit at B&H, bringing the price down to $1,698.99 for both. If you simply want the Sonnet eGFX 650 Breakway box on its own, both Amazon and B&H also stock the eGPU for $399.00 with free shipping. 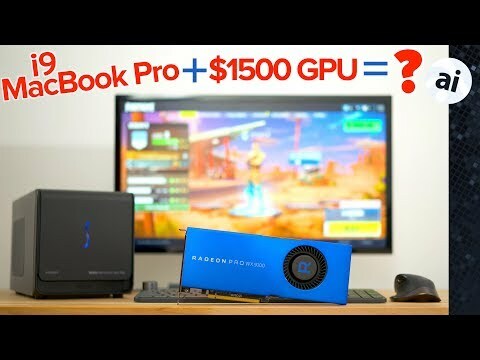 What I'd be curious to know from the avid Mac gamers on here, is what grfx cards are considered the "best" bang for your buck if you want to do eGPU gaming? I keep reading Nvidia is the best, but they're not officially supported yet on the Mac eGPU, but they can be made to work. I used to think that GPU was great until I found it its just a cheap gaming card with pointless extras and some great marketing. Strangely, after that pro app testing, we got an awful lot of requests to test Fortnite on it. I have a Vega 56 in a Core X and it handles everything I can throw at it, and didn't break the bank. From what I've read if you go higher than a 56 or a 1070 then while you will get more performance, you're paying way over the odds and most of that money is disproportionately sucking up power and generating heat and noise. I don't claim to be anything like an expert though. So you mis-used the product and the stock slips $.50 thinking it under-performs? Paid for by Intel? In my testing, the Vega 56 is the sweet spot for both power demand, and performance, versus cost. The RX580 is a good budget choice, with the smallest percentage of loss from bandwidth considerations. My only interest in eGPU is gaming. Hopefully this area matures.